“When you send a QR code to me in an email, it’s on my phone. The camera that would scan the QR code is on the back of the phone. Unless I’m some sort of a Jedi, I can’t scan it…..A QR code is fancy code for link. I have seen QR codes on billboards off the freeway. It takes me 11 minutes to scan a QR code stationary -- driving a car! … I see them on subway platforms. You have no signal. You can’t scan it… Think, think before you do. 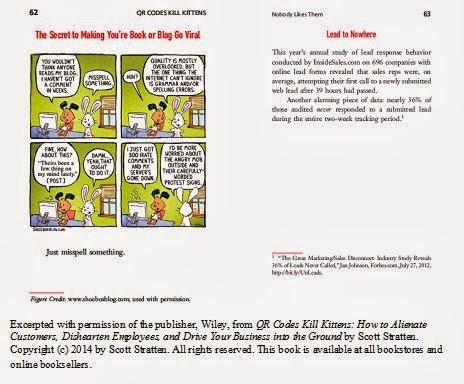 I think QR codes are brilliant if used properly …"
The fabulous 4-color picture book simplifies marketing strategy and let’s the reader vividly understand the various improper uses of QR codes all while shedding light on the importance of incorporating sophisticated logic and good old common sense. 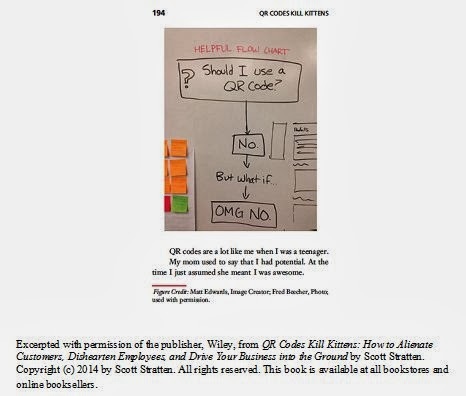 There is a great video rant from Scott on QR Codes and technology slip-ups in the first bullet item in the "Resources" section below. 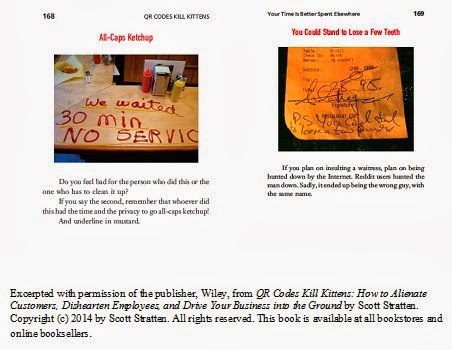 Through humor and delightful insights, Stratten describes the many marketing approaches and myths practiced by many professionals which simply destroy business (kill kittens). 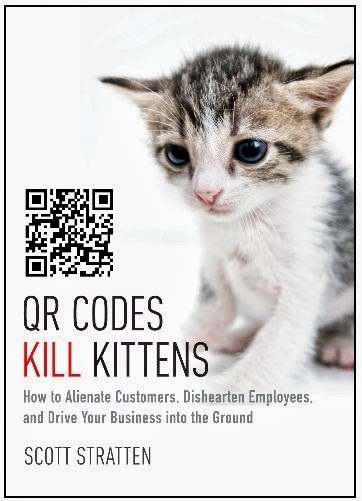 QR Codes Kill Kittens is divided into four sections illustrating why QR codes represent what’s wrong with business today including; They Don't Work, Nobody Likes Them, They are Selfish and They Take Up Valuable Time Better Spent Elsewhere. 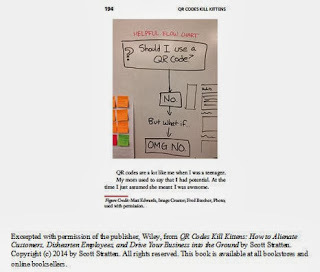 The "conclusion" section includes a scan of a hand illustrated "Helpful Flow Chart," which leaves you smiling. 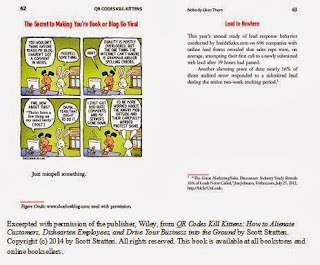 If you are wondering why your marketing campaigns are not working you need to read this easy, quick read, picture book. QR Codes Kill Kittens: How to Alienate Customers, Dishearten Employees, and Drive Your Business into the Ground by Scott Stratten is on sale now everywhere. 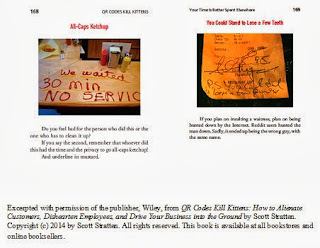 Photos courtesy of Scott Stratten and John Wiley & Sons (c) 2014. 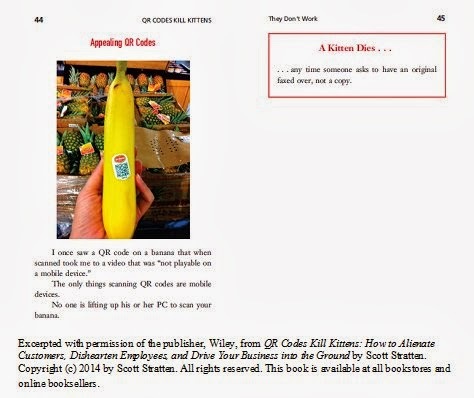 Photo scan of book pages - Excerpted with permission of the publisher, Wiley, from QR Codes Kill Kittens: How to Alienate Customers, Dishearten Employees, and Drive Your Business into the Ground by Scott Stratten. 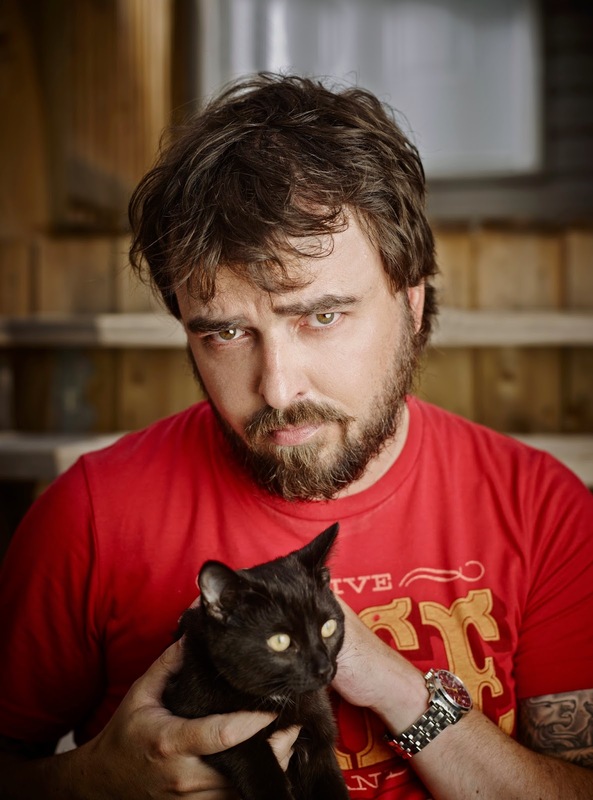 Copyright (c) 2014 by Scott Stratten. All rights reserved. 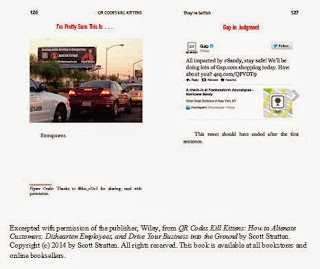 This book is available at all bookstores and online booksellers.